Exotic Barbados in October for only €499! 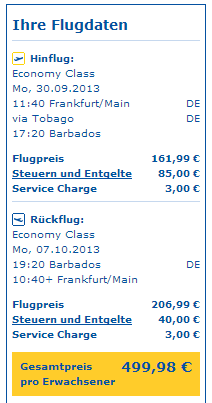 Condor now offers few dates where you can fly to Barbados for really good price, just €499. The departure is from Frankfurt am Main and you can travel in couple of dates mostly in September and October 2013. Return (€249): 30.9., 7.10., 14.10. « Cheap direct flights to Sri Lanka for only €424!